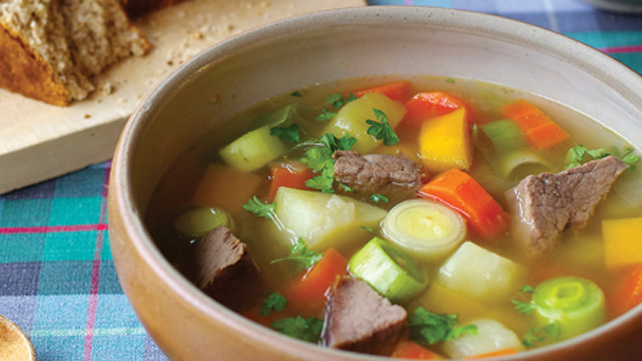 Cawl is traditionally a hearty dish made of meat and any vegetables available. There are many recipes often handed down through the family and vary from town to town throughout Wales. The dish is also known as ‘lobscows’ in areas of north Wales. It is often better the day after preparing when all the avours have developed. It is served in some areas in a wooden bowl and eaten with a wooden spoon with chunks of homemade bread and Welsh cheese. 01 Place the meat in a large saucepan, cover with water and bring to the boil. Simmer for 2-3 hours over a low heat. Leave overnight to cool and the following day skim off any fat that has risen to the surface. 02 Cut the meat off the bone and return to the stock then add the potatoes, carrots, swede or parsnips and simmer until cooked. Add more vegetable stock if required at this point. Season with salt and pepper. 03 Finally add the shredded leeks and just before serving throw in the roughly chopped parsley. You can thicken the cawl if required with a paste made with flour and water or fine oatmeal. Note It is better to use a cheaper cut of meat on the bone so that maximum flavour is obtained.